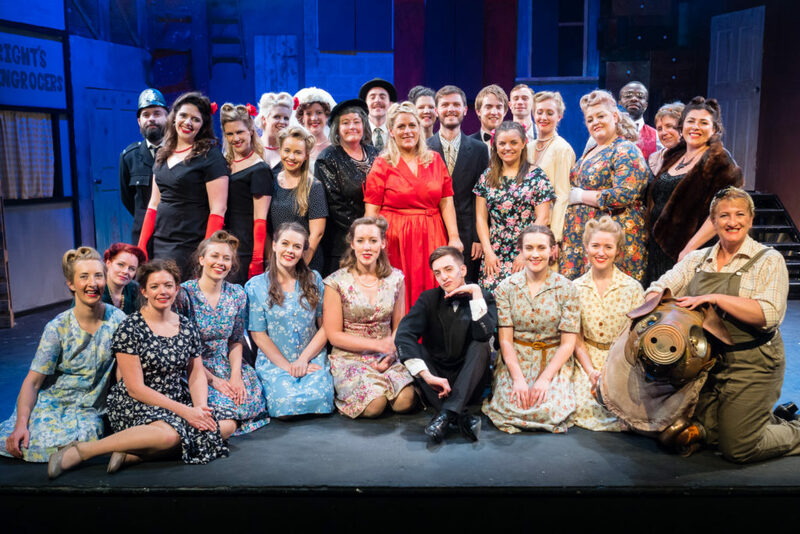 We staged the amateur premiere of the musical comedy, BETTY BLUE EYES in the summer of 2016. Based on the Alan Bennett film, “A Private Function”, and with songs by the brilliant George Stiles and Anthony Drewe (Mary Poppins, Honk! ), BETTY BLUE EYES is “witty, rude, loveable, warm, dramatic, hilarious…. A new smash musical is born” (The Times). It’s fair shares for all in 1947’s Austerity Britain. But in the little town of Shepardsford, local officials feather their own nests by taking far more than their own fair share, whilst humble chiropodist Gilbert Chilvers is still struggling to bring home the bacon. With rationing and unemployment taking its toll, the only light on the horizon is the impending marriage of Princess Elizabeth and Prince Philip. Members of the Town Council are fattening up a highly illegal pig called Betty for a lavish banquet in honour of the royal couple – this very private function is going to be the social event of the season and Gilbert’s wife Joyce is determined that they should be invited. But when the longed-for invitation fails to materialise, the two of them resolve to do whatever it takes to get their fair share of the banquet’s illegal pork roast! This utterly British musical is full of eccentric characters, such as the odd couple, Gilbert – an evangelistic chiropodist, and Joyce – a nobody determined to be somebody; Inspector Wormold – an obsessive destroyer of illegal meat; Mother Dear – “She’s seventy four and ravenous”; and of course, Betty the pig! Add to that a vibrant ensemble plus a deliciously infectious, toe-tapping, retro contemporary score and the result is musical comedy gold. “I promise I’m telling no porky pies when I say that this delightful new musical with an irresistible pig as its star left me grunting and snorting with pleasure, and just occasionally snuffling with sentimental tears” (The Daily Telegraph). If you can’t wait to see more you can get a glimpse of the show here! Fresh from spreading the love around, Betty Blue Eyes will reunite our wonderful Sister Act team of Damian Sandys (director), Steven Geraghty (musical director) and Della Bhujoo (choreographer).